Dear Fellow Gardeners, I require some assistance. Is this a weed? I plucked one out of my shade garden last year and I see its back, however I see a bloom forming and I do hate to pluck an unknown flowering plant less I know for certain it's a weed. Any guesses? March has been soggy and sloppy this year. 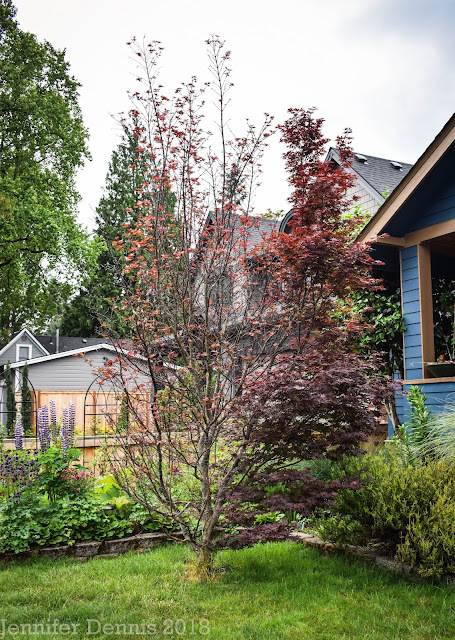 Granted, March in the Pacific Northwest is normally soggy, but we are on tap to set a record for rainfall this month and the extended forecast is calling for a cooler and wetter spring than normal. Go away La Nina!! Some plants are happily growing though. Delphinium is sprouting and looking happy and healthy. 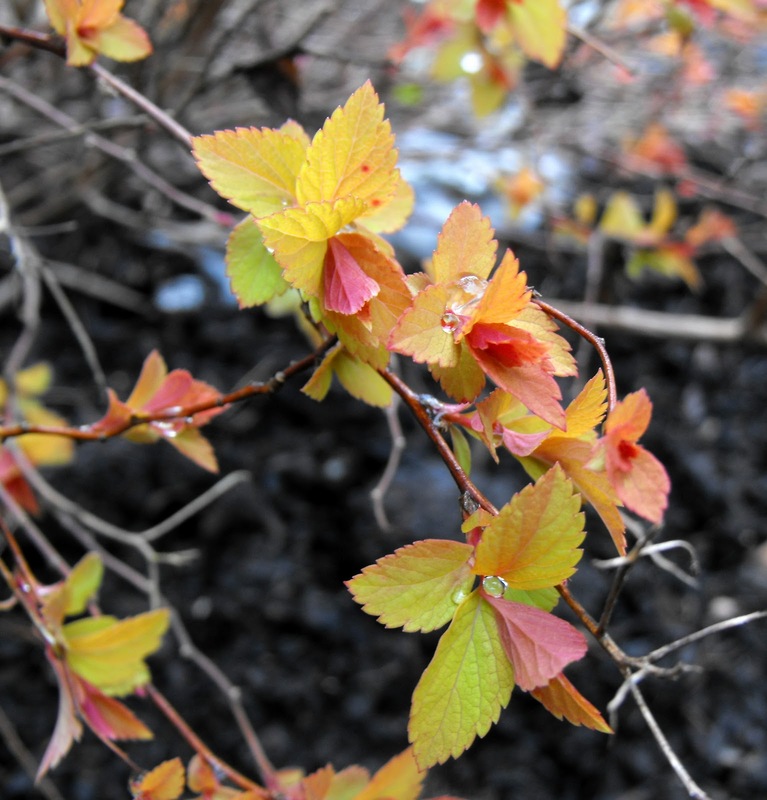 The dwarf Spirea is leafing out. I love the changing colors of this plants leaves. Shasta Daisy's have grown 4x the original size of the plant I purchased last year. 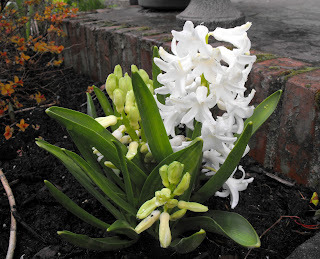 White hyacinths are blooms and flooding the front walk with a rich perfume. 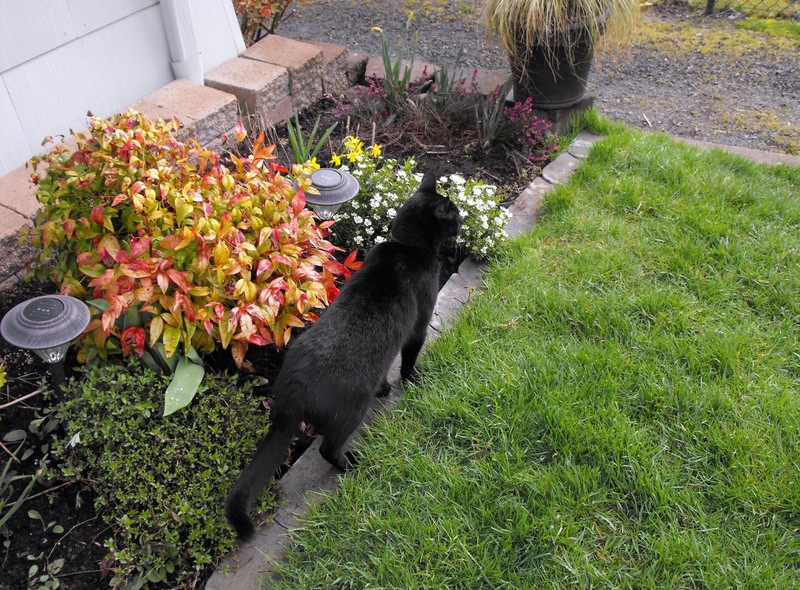 Even Puma, the rotten cat, is enjoying the scene, accompanying me on our tour of the gardens. Nandina, soapwart and candytuft in the back ground. Dutch Master daffodils from the Wooden Shoe Bulb farm have bloomed just this past week. Late for them. Paper whites, that I did plant late (mid-January) is getting a bloom off. The primroses I received from my next door neighbor two years ago are doing well. Now, these primroses are not the English style you see at garden shops and super markets..what variety are they? 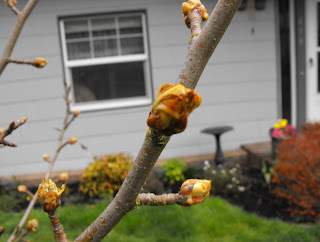 The Bartlett pear will be leafing out soon and I hope gracing us with a few blossoms. 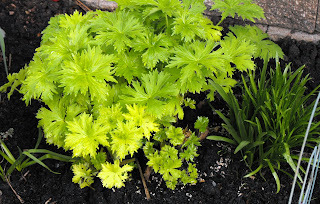 And finally, the ever hardy sedium plants in the little rock gardens never seem to die, despite my manhandling. Oh Jenni! Your weed is not a weed at all, it's a Trillium, a beautiful one with mottled leaves. Please please leave it to bloom! 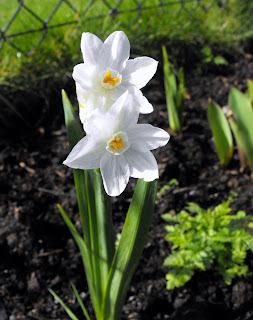 You are so lucky to have one growing in your garden, without any help from you. It must be a great spot for native wildflowers. Thank you Alison! After reading your post about trillium's last week, I though I should hold off and ask about this one! Great photos. Your hyacinths look huge! 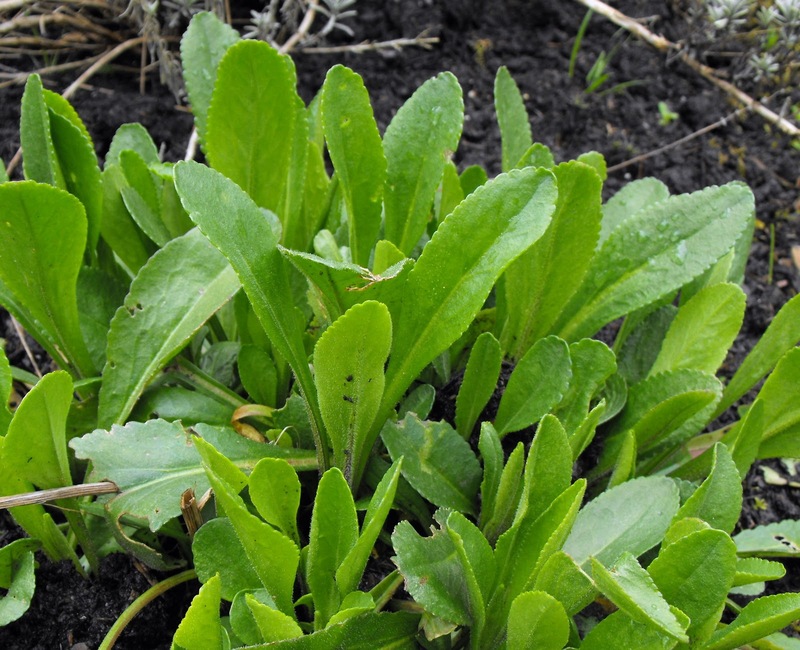 Are you going to divide the primrose? I divided some primrose today. The first photo looked like a tulip at first but then I saw the base and didn't think so. I looked up trillium suggested by Alison - I learned something new, never heard of trillium before. Very pretty. Yes, a trillium, indeed. It is the provincial flower of Ontario, but there are plenty growing here, and I just saw some last week at the Native Garden in Oak Bay. What a lovely display of colour you have already! I just found your blog through Blotanical - glad I did! Looking forward to reading more soon. So it does appear I've got a trillium..and I'm excited that I asked first this year and didn't pull it, although I feel like a heel for doing so last year. I will probably divide the primrose this spring and find some more shady places for it to sprout. My neighbor's side yard is full of that primrose. It's beautiful! You should check out a Forsythia "Gold Tide". 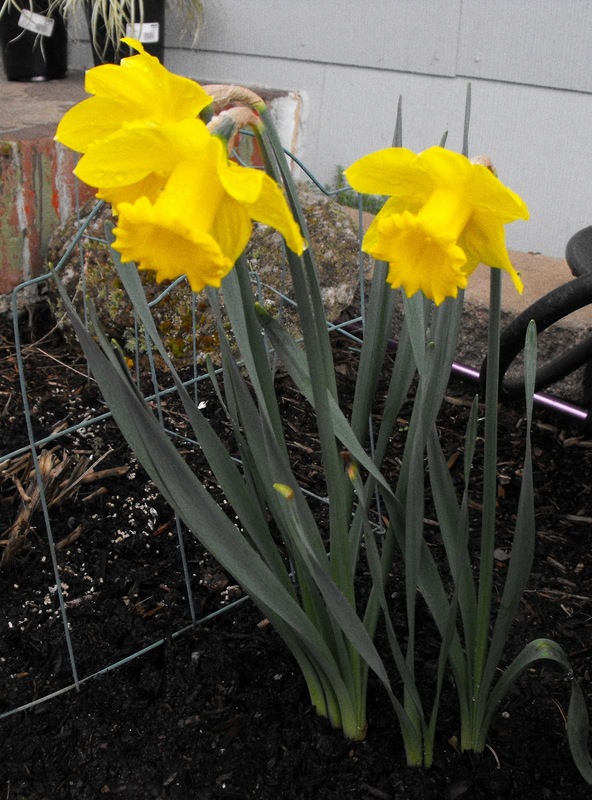 They are very round and low-growing, they do not get leggy and sprawly like Forsythia can get. 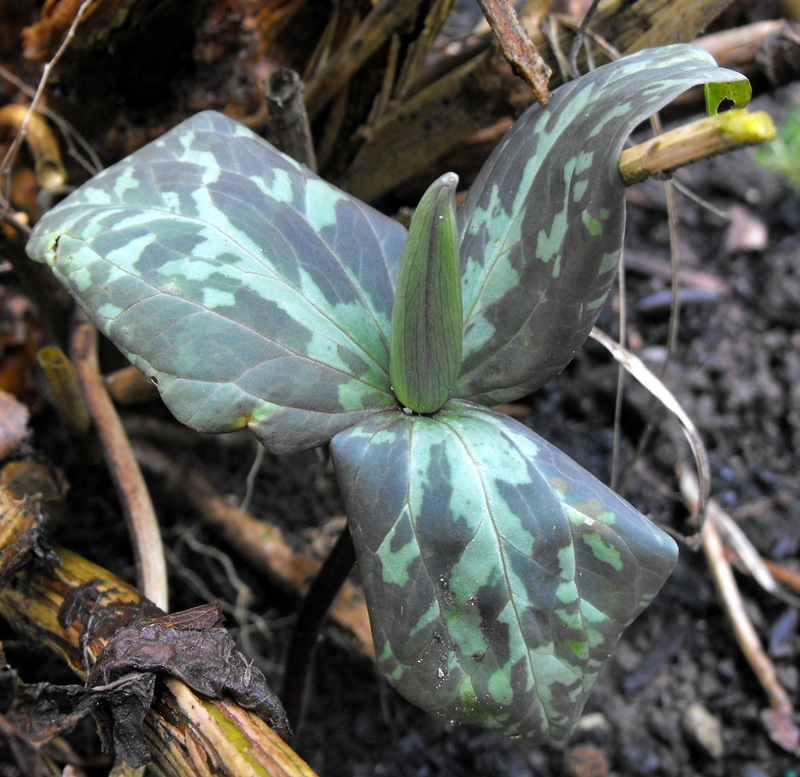 I am very jealous of your variegated leaf Trillium, I have just 3 little ones that struggle to grow each year then I reallised that they are on the local cat path trough my garden, I hate to dig them up, dilemma!!! Found you true your comment on the Dutch flower fields! Think of it as an exotic wildflower. 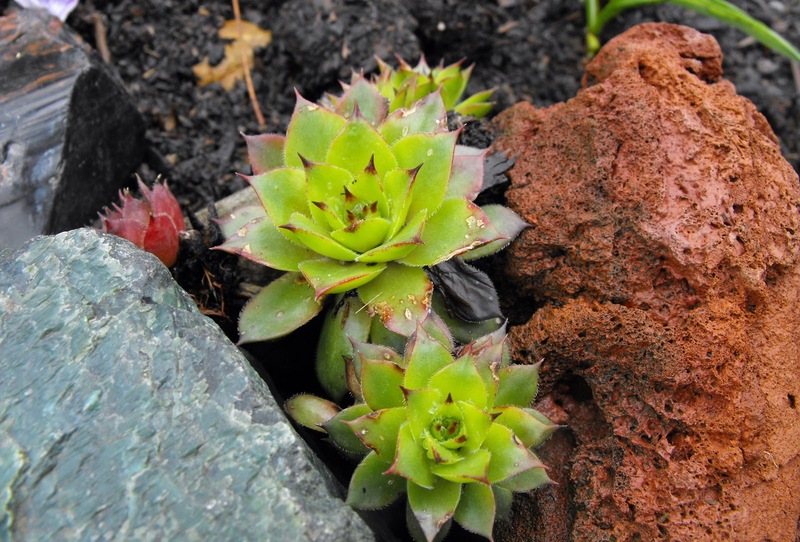 These plants (Trillum) are endangered in many areas and they are illegal to remove. Thank you for taking the time to comment on my post. The comment moderator is on and I will approve comments as soon as I can. Thank you for stopping by! 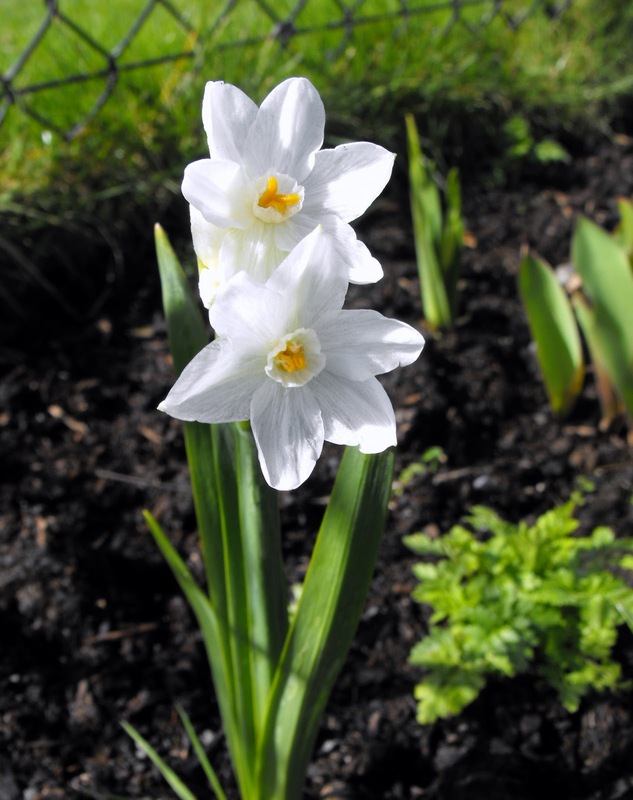 What are YOUR gardening plans for the weekend? Log Truck Crash into our front yard. 2/3rd of winter down. What winter? 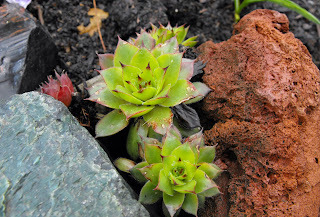 Great Garden Bloggers Around the World!